Promotes streamlining and labor-saving in manufacturing process while improving uniformity and quality of final product. Streamlines and promotes labor-saving in the making of hand-roll sushi. Contributes to reducing the number of workers needed on the manufacturing line. 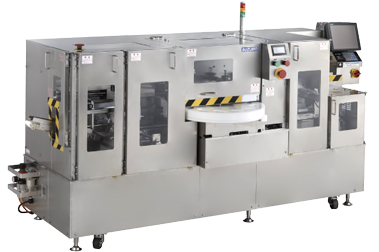 Production capacity of 2,000 rolls per hour. Speedily creates uniform and even products at a level not possible by human hand. Point-of-sale (point-of-purchase) label/Point-of-purchase labels can be automatically attached inside the machine. Note: labelers are an optional accessory requiring separate purchase. * Requires advance check to ensure correct wrapping in place for desired product.